Scientists have calculated the total amount of plastic ever made. Spoiler alert: it’s a lot. But what’s even more disturbing is where all this plastic is ending up. Since large-scale production of plastics began in the 1950s, our civilisation has produced a whopping 8.3 billion tonnes of the stuff. Of this, 6.3 billion tonnes—around 76 per cent—has already gone to waste. Such is the conclusion reached by a team of researchers from the University of Georgia, the University of California at Santa Barbara, and the Sea Education Association. Now published in Science Advances, it’s the first global analysis of the production, use, and fate of all the plastics our species has ever produced—and it’s showing just how badly we need to rethink plastic, and why we’re using so much of it. For the study, the researchers compiled global production statistics for resins, fibres, and additives from various industry sources, breaking them down according to type and consuming sector. 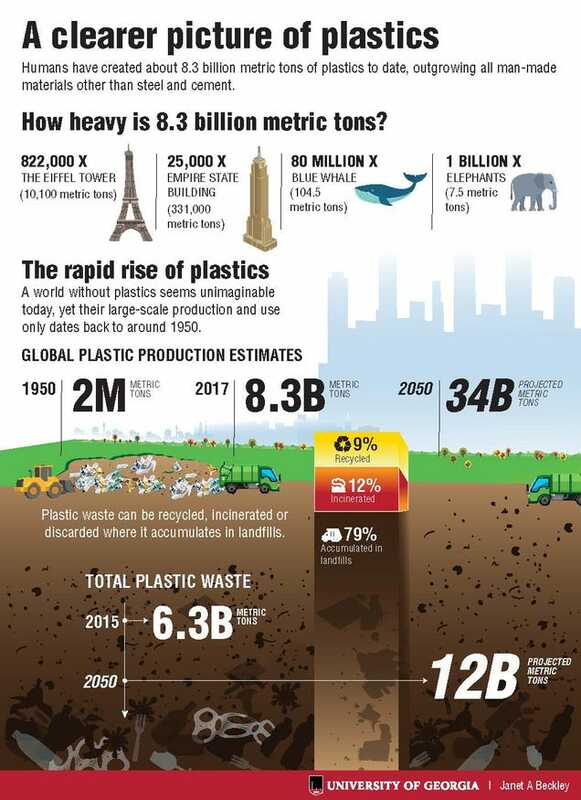 They found that annual global production of plastics skyrocketed, from two million metric tonnes in 1950 to a jaw-dropping 400 million metric tonnes in 2015. That’s a level of growth not seen in any other material, save for construction where concrete and and steel are king. But unlike concrete and steel—materials that hold our infrastructure together—plastic tends to be thrown away after just one use. That’s because a hefty portion of it is used for packaging. The new research also shows that plastic production is still growing. Roughly half of all the plastic that exists was made in the last 13 years. As noted, 76 per cent of all the plastic ever produced is now waste. Of this, a mere nine percent has been recycled and 12 per cent has been incinerated. 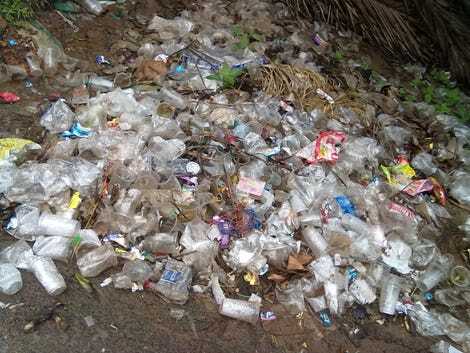 Nearly 80 per cent of all plastic waste has accumulated in landfills or the natural environment. Back in 2015, the same team of researchers estimated that around eight million tonnes of plastic poured into the ocean in 2010. The researchers predict that, if things continue the way they are now, around 12 billion metric tons of plastic waste will have entered into landfills or the environment by 2050. That’s right—12 billion tonnes. That number is practically impossible to fathom. That’s about 35,000 times heavier than the Empire State building, and about a tenth the weight of all the biomass on Earth. We humans are steadily introducing a new material into the fabric of the planet—a synthetic compound that can last anywhere from 500 to 1,000 years depending on the type of plastic. It’s yet further evidence that we’ve entered into a new planetary era, one dubbed the Anthropocene. Absolutely. In addition to cluttering our waterways, oceans, and motorway slip roads, plastics are a hazard to animals and human health. Plastic bottles are particularly problematic; around 50 million bottles are thrown away each day in the United States alone. From an environmental perspective, an estimated 17 million barrels of oil is required each year to produce water bottles (enough energy to fuel more than a million vehicles in the US for a year), not to mention the oil that’s burned while transporting them. Geyer and Jambeck aren’t saying that we need to stop making plastic. Rather, they’re asking manufacturers to reevaluate the reasons for using plastics in the first place, and to come up with alternatives. Scientists should also devise new, high tech methods to degrade plastic and potentially convert it into liquid fuel or useful energy. At the same time, we need to be smarter about the way we dispose of plastic, both at the waste-management level (Sweden, for example, has its recycling act together) and in our homes.